July 15–21 EveryBody Deserves a Massage Week Share Your Work EveryBody Deserves a Massage Week is the perfect time to reach out and see what differences you can make in your community. And using this experience to market your business is an inexpensive way to connect with a large number of potential clients, while you give back. Here are a few of the professional benefits you might reap from getting involved in this, or any, charitable event: • Gets your name and business name out in the community. • Creates goodwill for you and for the profession as a whole. • Lets you introduce massage to a new group of people. • Allows you to get hands-on time and see new bodies in unique client situations you might not otherwise see. We Make It Easy! Don't know what to do for EveryBody Deserves a Massage Week, July 15–21? 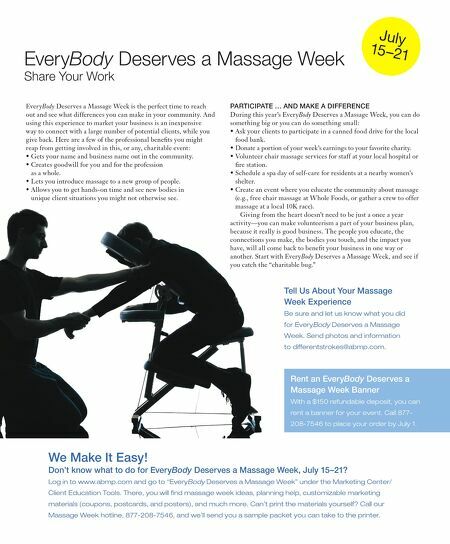 Log in to www.abmp.com and go to "EveryBody Deserves a Massage Week" under the Marketing Center/ Client Education Tools. 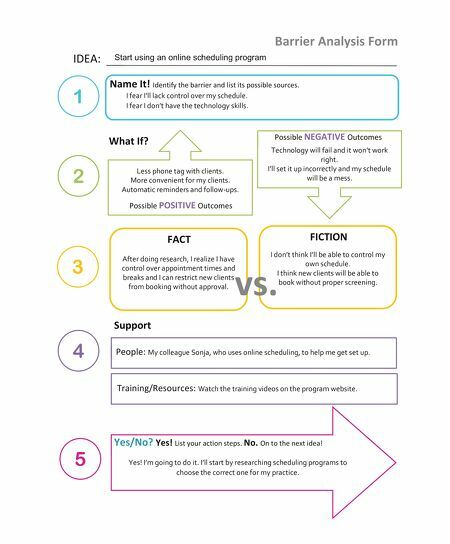 There, you will find massage week ideas, planning help, customizable marketing materials (coupons, postcards, and posters), and much more. Can't print the materials yourself? Call our Massage Week hotline, 877-208-7546, and we'll send you a sample packet you can take to the printer. Rent an EveryBody Deserves a Massage Week Banner With a $150 refundable deposit, you can rent a banner for your event. Call 877- 208-7546 to place your order by July 1. PARTICIPATE … AND MAKE A DIFFERENCE During this year's EveryBody Deserves a Massage Week, you can do something big or you can do something small: • Ask your clients to participate in a canned food drive for the local food bank. • Donate a portion of your week's earnings to your favorite charity. • Volunteer chair massage services for staff at your local hospital or fire station. • Schedule a spa day of self-care for residents at a nearby women's shelter. • Create an event where you educate the community about massage (e.g., free chair massage at Whole Foods, or gather a crew to offer massage at a local 10K race). Giving from the heart doesn't need to be just a once a year activity—you can make volunteerism a part of your business plan, because it really is good business. The people you educate, the connections you make, the bodies you touch, and the impact you have, will all come back to benefit your business in one way or another. Start with EveryBody Deserves a Massage Week, and see if you catch the "charitable bug." Tell Us About Your Massage Week Experience Be sure and let us know what you did for EveryBody Deserves a Massage Week. Send photos and information to differentstrokes@abmp.com.